ST. GEORGE — A stolen bottle of tequila and motorists slowing to look at an inmate transport bus with a blown tire triggered a series of events Wednesday that ended with multiple crashes, a blocked off-ramp and a suspect who tried to just walk away from it all. Shortly before noon, officers were dispatched to a St. George liquor store where a woman allegedly took a bottle of tequila and left the store without paying for it. Officers began searching for the woman after witnesses provided descriptions of her, including that she was wearing a green shirt and driving a dark-colored Hyundai passenger car. At the same time, a Purgatory Correctional Facility transport bus carrying 22 inmates blew a tire and was disabled in the emergency lane of northbound I-15 near Exit 10. Multiple deputies responded to that scene to secure the area and maintain custody of the inmates, while a second vehicle was requested to transport the inmates back to jail. Traffic slowed as motorists approached the disabled transport bus, creating a backup that stretched as far back as Exit 8. “We send several deputies out to something like that because our main concern is security, and then finding a commercial vehicle large enough to transport 22 inmates back, that was another issue,” Washington County Sheriff’s Lt. Dave Crouse said. 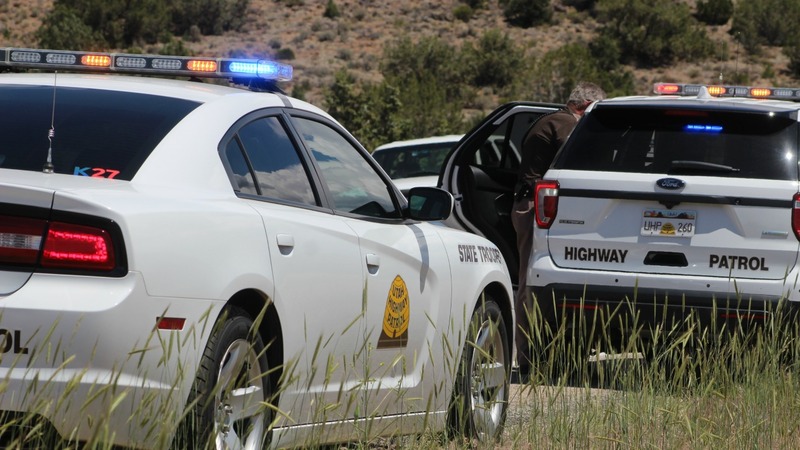 Meanwhile, Utah Highway Patrol troopers were dispatched to several crashes in multiple locations between exits 8 and 10 on the northbound side of the interstate, UHP Trooper Mike Murphy said. Troopers found “cars that were all over the place, I mean it was a mess out there,” he said. They were initially unaware that there was a disabled jail transport bus waiting for a replacement vehicle, or that police were looking for a theft suspect in the same general area. That all changed when Murphy responded to a crash involving a semitractor-trailer that was disabled at Exit 13 on the northbound side of I-15. The driver told Murphy that he was heading north in heavy traffic near Exit 8 when a dark-colored passenger car, later confirmed to be a Hyundai, came up on the right side of his truck “either in the right-hand lane or in the emergency lane” and struck the rear wheels on the passenger’s side of the semi, which blew out both of the car’s tires on the driver’s side. “As it turns out, while police are looking for this vehicle from the theft at the liquor store, the car is coming up on the right-hand side of a semi and sideswipes the semi,” Murphy said. The semi driver told the trooper that he felt a “bump” on his trailer, and when he looked over he saw the woman continue past him and get off the interstate at Exit 10, while he continued north to Exit 13, where he was able to pull over safely and wait for police. In the meantime, the Hyundai stopped in the middle of the Exit 10 off-ramp and the driver walked away, leaving the lanes partially blocked and creating a backup of vehicles attempting to exit the interstate. Washington City Police officers responded and secured the scene until UHP troopers arrived. Several witnesses alerted police to the driver’s actions as well as her direction of travel. A short time later, St. George Police officers located the woman near Batteries Plus on Red Cliffs Drive and took her into custody. The Hyundai was impounded and towed from the off-ramp. “So we handled the accident portion of the incident while St. George PD handled the arrest for the retail theft,” Murphy said. 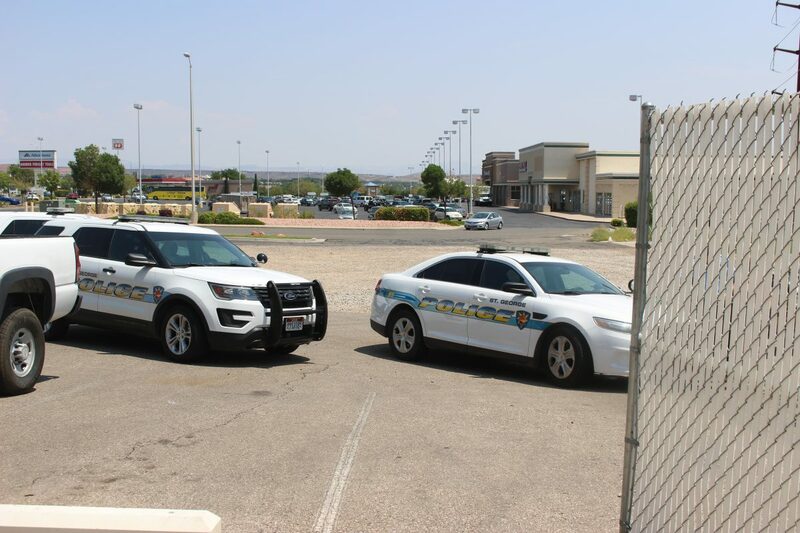 St. George Police Department public information officer Tiffany Atkin confirmed that a woman was arrested in connection with the theft. She added that while officers were handling the theft call, the department also sent a number of officers to manage the road closure on North Bluff Street that was triggered by the natural gas line rupture. The St. George Police Department, Utah Highway Patrol, Washington City Police Department and the Washington County Sheriff’s Office responded and assisted with multiple scenes. Can you tell me what building homes and infrastructure has to do with what happened in this article? Were these inmates being transported to a job site to build more new homes? Was the lady who stole the Tequila heading to the next house in The Parade of Homes? Was the semi tractor-trailer that was disabled at Exit 13 broke down due to some lack of infrastructure? That’s a stretch. Sounds like a series of events to me. Of possibly a good old fashioned cluster #@%$. You think unbridled growth is going to help this area? The only people on your side is going to be greedy developers, and the local politicians who let it happen after getting their palms greased. Real Life, I’m with ya on ALL this. I don’t believe anyone here wants rampant development. My point was about the incidents that happened, which I, (just me, personally) believe had NOTHING to do with growth. Sounds like several episodes of “Cops,” in quiet little St. George, used to be…….. So I guess instead of dispatching multiple deputies to the disabled prisoner transport bus “to secure the area and maintain custody of the inmates,” perhaps the first deputy on scene should have assessed some potential hazards one of which is traffic moving at 75-80 MPH. Maybe the UHP should have been alerted to initiate a traffic break at Exit 2 to slow traffic so that the the impending collisions could have been avoided. Sounds like a lack of communication contributed a great deal of paperwork for UHP officers. Standing around waiting for a second transport bus, with plenty of emergency lights activated is always a recipe for disaster. This whole story sounds like an episode of Keystone Cops. After this lady caused an accident and could have caused another, I look at the purgatory bookings and she only got arrested for theft under $500 and had already been released from jail. I’m disappointed, what about wreckless driving? At least they had time Tuesday to book Jessica Twiggs again on a couple warrants… remember, her idiot boyfriend’s dog got tazed. She had a couple of shoplifting charges the past few months too which I guess might have been ignored and led to the warrants. LOL. A pair of real gems those two. Little St. Geezy ain’t so little anymore. Better get used to it. I was listening to the radio and got an Amber Alert type of warning about the Gas on Bluff and to stay away. Did it tempt me to drive down and check it out? he he … no That Hwy is a cluster. MAN did they cut down a forest of trees along there.